Saturdays for us mean leisurely breakfasts (read: PANCAKES! ), walks in the park and general laziness. But you can't just have any old pancakes - you've got to have great pancakes to make sure you start your weekend off on the right foot. We have a bunch of different healthy pancake recipes that we love - but lately, there's been a new favourite on the block! 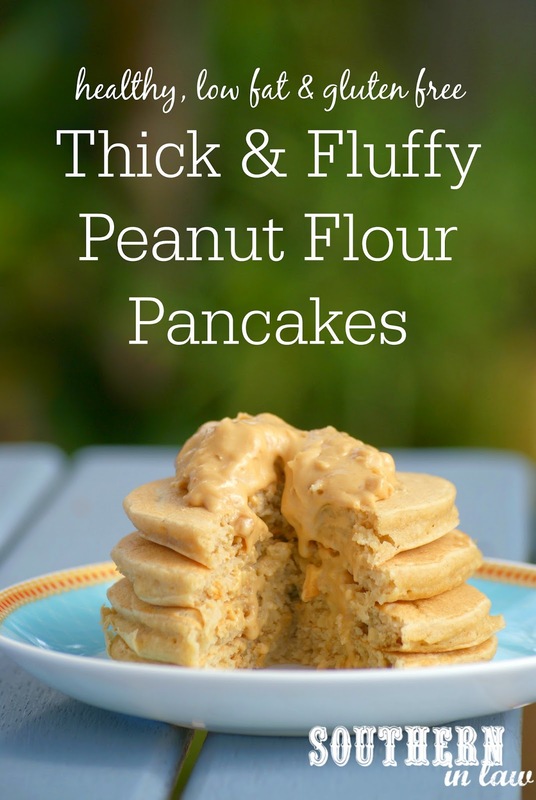 These Peanut Flour Pancakes are absolutely delllllliccccccccccious because they're super thick and fluffy! 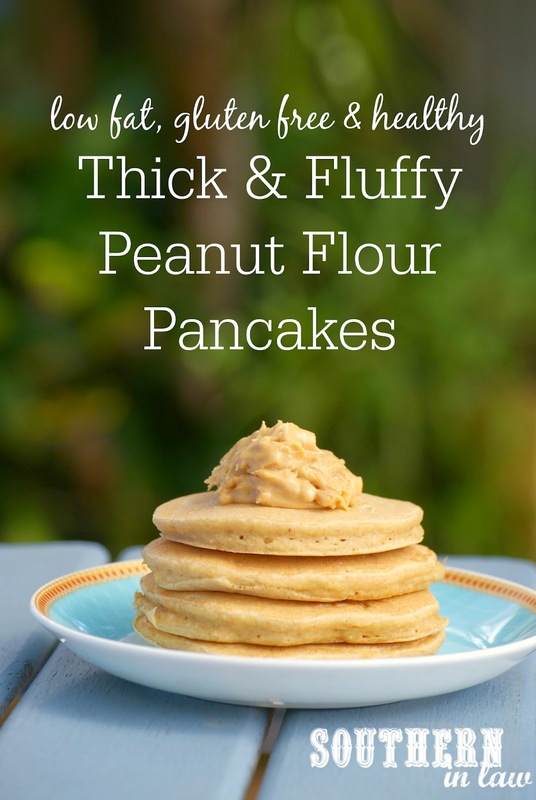 Whether they're eaten hot or cold (as I told you yesterday - I have a random obsession with cold pancakes at the moment), topped with peanut butter or butter and syrup or eaten straight up, they're so so good! 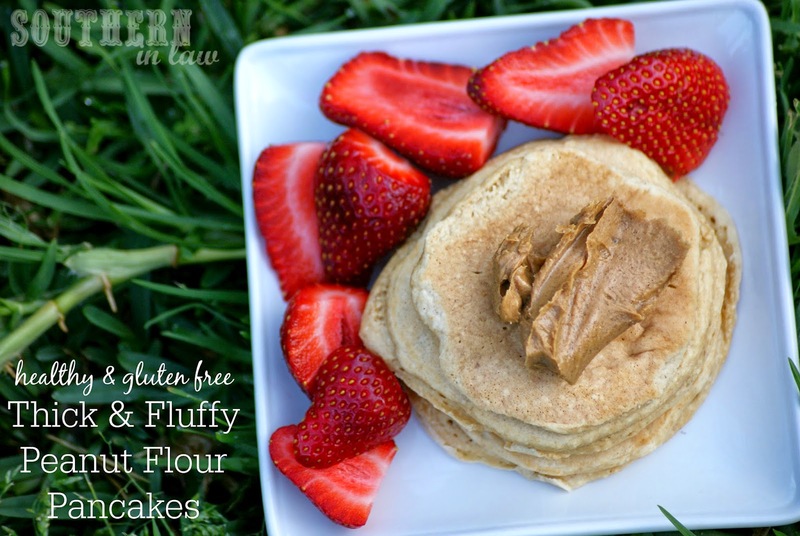 I've been loving them topped with peanut butter (or a mix of peanut butter and coconut oil!) with a side of fresh, juicy strawberries (as you know if you've read SIL for a while, there's no such thing as too much PB in Kristy's world) whilst Jesse likes his with butter and maple syrup. Lightly grease a medium fry pan/crepe pan and heat over a medium-low heat. Beat your eggs with your milk, applesauce, vanilla and maple syrup. Cook your pancakes ~2 tbsp of mixture at a time (or larger/smaller depending on how big you want your pancakes). Flip once bubbles have formed on the top of your pancake and the underside is lightly golden, flip and cook until lightly golden on the other side - repeat until all of your pancakes are cooked. We make ~15 medium pancakes from this recipe and usually serve 3 pancakes per person plus toppings! *We used 2 tsp maple syrup which made just lightly sweet pancakes (as we add toppings that are sweet! ), however, you can sweeten them to your liking. **Find out more about oats on a gluten free diet here. If you can't tolerate oats, feel free to use another 1 cup of gluten free plain flour or buckwheat flour. But tell me, what does your typical weekend look like? What kind of things are "weekend things" to you? Saturday is always our chilled day with a relaxed breakfast and do-nothing kinda day (except I always inevitably end up shopping somewhere ;P) whilst Sundays are our busy days - rushing to get ready for church in the morning, spending most of the day at church with our friends and then relaxing in the afternoon with our family.